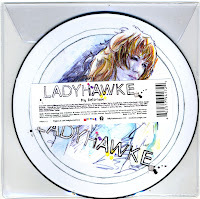 When I wrote about 'Paris is burning' by Ladyhawke in August, I noted that that single contained only a remix and the French version of the song. What I didn't know was that in the mean time the single had been re-released in March. This limited release (only 600 copies were made, apparently) was pressed on white vinyl and featured the original version of 'Paris is burning' plus a remix. Of course, a download bundle was also available. While the original release reached number 61 in the UK singles chart, this re-release reached number 47. 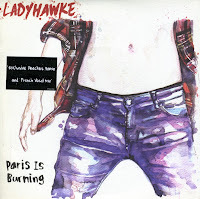 'Paris is burning' was the second single by Ladyhawke, taken from her debut self-titled album. Originally this track reached number 61 in the UK singles chart, however when it was re-released in March 2009 as a digital download and limited 7" vinyl, it improved on this chart placing and peaked at number 47. What's a bit strange about this 7" single, is that it doesn't contain any 'regular' version of the track, just a remix and a French language version. 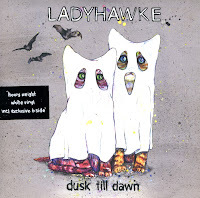 'Dusk till dawn' is another single by New Zealand pop artist Ladyhawke. Pressed on heavy white vinyl, it is a beautiful collectors item. The track itself is not as catchy as 'My delirium', but it's still a slice of modern synthpop. Released in the autumn of 2008, the single peaked at number 78 in the UK singles chart, but did not chart in other territories. 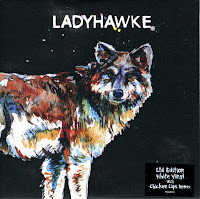 Ladyhawke was born as Philippa "Pip" Brown in Wellington, New Zealand. During her childhood various illnesses and allergies kept her in and out of the hospital. In 2008 she debuted with her self-titled album, from which several singles have been taken. Her biggest hit so far is 'My delirium', a catchy synthpop anthem which led to comparisons with Kim Wilde in various media. The single peaked at number 33 in the UK singles chart and number 8 in Australia. This picture disc edition comes on extremely heavy vinyl.